Maybe it’s due to humanity’s current fascination with zombies, or maybe it’s just the rock-solid game design, but Plants vs. Zombies is still the king of the tower defense sub-genre. As proof, the game continues to find new life for its undead antagonists on new platforms more than a year after its original PC release. If you’ve never played Plants vs. Zombies before, the DS version is a pretty great place to start. It combines the convenient portability of the iPhone version with the complete, robust feature set of the PC version, making only a few sacrifices in the conversion. The game tasks you with using plants in your yard (and, eventually, on your roof) to defend your house from a variety of zombies. The playing field is divided into squares that make up different rows on which the zombies will approach from the right side of the screen. We can’t say they “shamble,” as most zombies are wont to do, because after the first few levels of the adventure mode you can never really be sure how a zombie is going to assault your garden. It may run in, decked out in full football attire. It may ride in slowly on a Zamboni or bobsled. Heck, it may just plunge down from a bungee cord, attached to who-knows-what up above. This sort of variety is part of what makes PvZ such an addictive experience. The game is constantly introducing new types of enemies for you to face, as well as giving you more and more plants with which to deal with the threats. As you acquire more and more of the nearly 50 plant types, the ways in which you can approach each level becomes somewhat staggering. The gameplay itself also switches things up at a steady pace, making sure you never get into a rut of performing the exact same actions time and time again. When you get used to fending off zombies in daylight, suddenly you have to deal with them at nighttime. Then in water. Next thing you know you’re not even planting plants at all, you’re playing versions of bowling or Whack-a-Mole. The main adventure mode itself is lengthy and satisfying on its own, weighing in at 50 levels, but as you play you also unlock a ton of different modes to experiment with. The game is packed with minigames, puzzle stages, a survival mode and even a sort of Zen garden. It all combines into a package that’s full of variety and replay value. There’s also an entertaining competitive multiplayer mode that can be played with a friend, whether you both own a copy of the game or not (though in our experience, be prepared for long load times if you only have one game card). 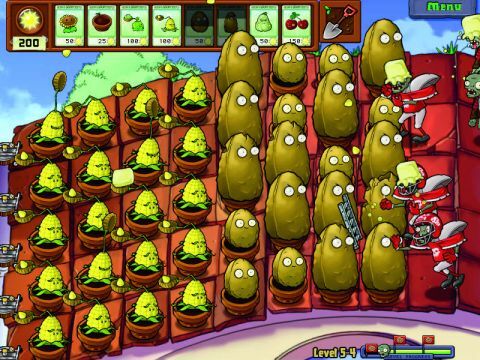 The multiplayer puts one person in the familiar company of the plants while their opponent gets to send in attacking waves of zombies. This port isn’t quite perfect, though. While it by no means looks bad, the DS version is easily the worst looking of the bunch. There’s also the issue of limited screen real estate. The top screen is barely used, meaning that a lot is going on at once on the bottom screen. This isn’t usually a big deal, but when things get really hectic it can become tough to keep track of everything, and the framerate can definitely take a hit. Of course, since this is essentially the same experience that you’ll find on the PC, Mac or Xbox 360 (aside from a few new minigames) there’s little reason to double dip on this version unless you desperately want the game in a more portable format. And even then, you might be tempted just to drop a few bucks on the iPhone or iPad version. The big difference there, however, is that the iOS game is essentially the barebones adventure mode. While that’s still fantastic, it means you’ll miss out on the plethora of other modes that the DS version offers. As such, if you’ve only played the game on your iDevice and are desperate for more content, this might be an enticing upgrade. So while this game won’t be a must-own for anyone but the die-hard PvZ player on other platforms, it’s a fantastic way for new players to find out what they’ve been missing. If you’ve been passing up on this charming and highly addictive game for this long, you’re starting to run out of excuses. Description Yet another round of plant-centric zombie defense? Yes, please.